I know, I know, I'm super late in getting this post up. I've been quite poorly lately and have barely been doing much of anything, let alone blogging. 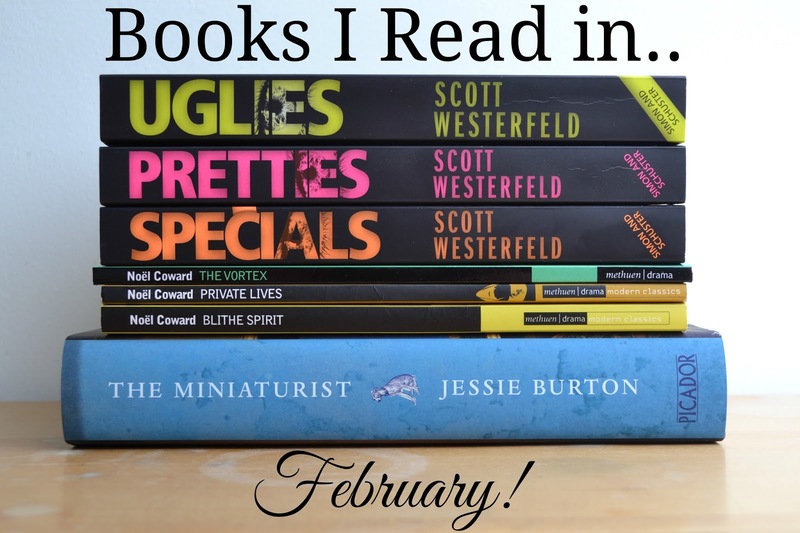 But I had a good reading month in February and wanted to share! My logic for picking books to read in February was flawless- I picked up the Uglies trilogy and after finishing that decided to read books with the odd rubbery covers that remind me of Nars makeup. See? Flawless thinking on my part. I ended up spending a lot time on The Fifteen Lives of Harry August but that got paused, so I'm pretty happy with how much I finished considering. I posted a full review and discussion of this series here! I'm currently working on making my characters speak in my degree and since they had me writing some screenplay I decided to do a little extra reading and pull out my little Noël Coward collection. I love the dialogue in his work, but for this one- one of his earlier works from 1920, the plot didn't quite fit for me. I wouldn't have known quite what was going on if I hadn't read the forward I don't think. It was still worth reading though. Nobody writes British wit quite like Noël Coward in my opinion. My favourite of Noël Cowards work, I saw this in Manchester a couple of years ago and found it absolutely hilarious. Two exes find each other in a hotel while on their honeymoon with their new spouses. Reading it was a pleasure, the story is funny and the characters are well developed. They aren't particularly likeable but you end up liking them anyway. Or at least liking that you dislike them. A very close second for my favourite, I found myself laughing out loud more than once as I read. In this story a writer accidentally brings back the ghost of his dead wife, much to the distaste of his current wife. You can't beat that. The work up to the ending is flawless, especially when you consider that Coward wrote this in five days in 1941 during the war. I wish I could see this performed. I hauled the Miniaturist here and it took me a while to get round to it because I'm not much of a historical fiction reader. But I was looking through old reviews on my blog and found this one of The Crimson Ribbon by Katherine Clements. These two books are only set 40 years apart so I thought that along with it having a rubbery cover, that it would be a good way to explore the historical fiction genre comfortably. This book is pretty much the definition of a slow burn, it took me a good amount of time to read even though it's not a huge book. It was calm for a long time then so much drama, the hits just kept on coming over and over. This book deals with a lot of things; racism, homophobia, sexism, and just that times values in Amsterdam which was fascinating as I love that city but boy does it have a past. I feel like this book was made for a re-read. There's so much detail and foreshadowing that I think would be amazing the second round when you know what is going on and how the story ends. Have you read any of these books? What did you read this month? *Amazon links are affiliate links, if you buy a book from them I get a tiny percentage without any cost to you. Neat, huh?